This spring, the IBEW Local 1245 organizing program dispatched five teams of organizing stewards to central labor councils across our service area, to help get out the vote for pro-union candidates for both local and state offices. 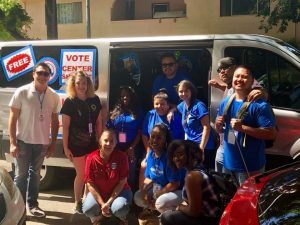 In the Fresno area, 1245 coordinated two teams in the two weeks leading up to California’s Primary Election. The first team, which consisted of Miguel Pagan, Brittney Santana, PJ Saenz, Greg Simmons and Renae Mendez, hit the ground running during the last week of May, and the second team, comprised of Melissa Echeverria, Que Thompson, Ashley Finley, Gabrielle Baker and Teofilo Freeman, took over for the home stretch, up to and including Election Day. 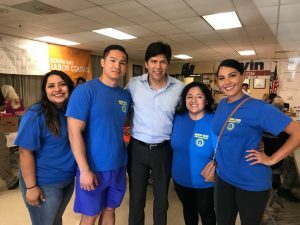 Both teams endured record heat as they went door-to-door in the far reaches of the valley to support labor-endorsed candidate Eddie Valero, candidate for the Tulare Board of Supervisors. 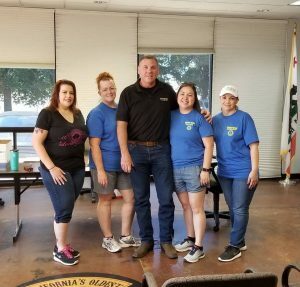 In the North Valley, the Local 1245 team of Julie Gonzalez, Kristen Rasmussen, Rachel Ramirez and Aileen Zuehlke helped get out the vote for Assembly member Heath Flora, as well as Stanislaus Board of Supervisors candidates Tony Madrigal and Frank Damrell. For the past 20 years, this Board of Supervisors has consisted entirely of anti-union politicians, and previous attempts to flip seats have not advanced past the Primary – until this year. Both Madrigal and Damrell secured enough votes to advance to the general election in November. 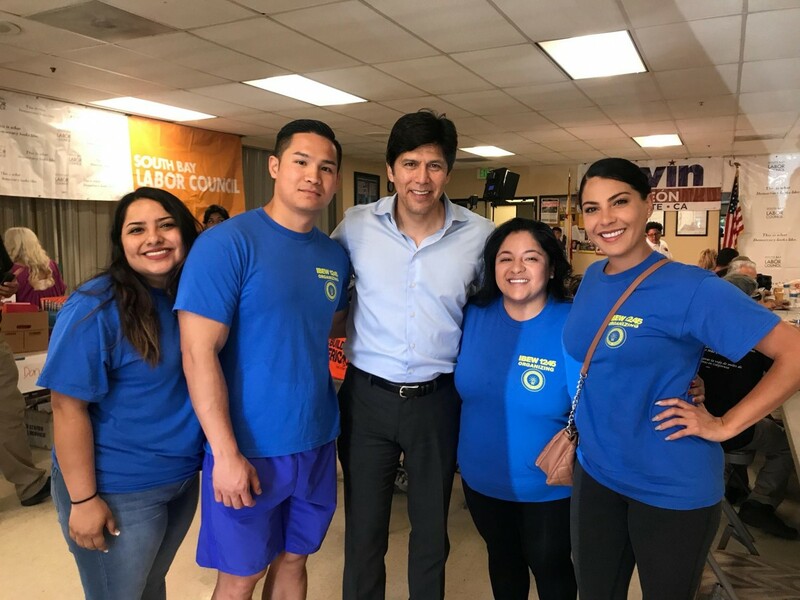 In Sacramento, the Local 1245 team of Nilda Garcia, Charlotte Stevens, Ivan Pereda, LaDrena Gunn-Swangin, Marissa Nagore, Vanessa Mejia and Alvin Dayoan helped get out the vote for Congressional and local City Council races, as well as Gavin Newsom for Governor and Tony Thurmond for State Superintendent. Their communities were among the first to participate in California’s newly implemented Voter’s Choice Act process. In the South Bay, the 1245 team of Alyssa Fernandez, Felicia Martinez, Brenda Balcazar, Megan Franco and David Ly worked tirelessly for pro-labor candidates in local races, including City Council and County Supervisor. And in the East Bay, Local 1245 Organizing Stewards Arnaldo Lizarraga and Ruben Hernandez worked tirelessly over the final four days to get the vote out in Alameda County. 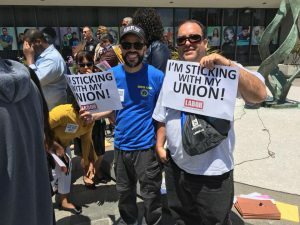 They also participated on a Janus rally in Oakland on June 5, worked on advancing Measure A, and assisted with local races. Their hard work earned them special recognition from the Alameda Labor Council at their recent delegates meeting. 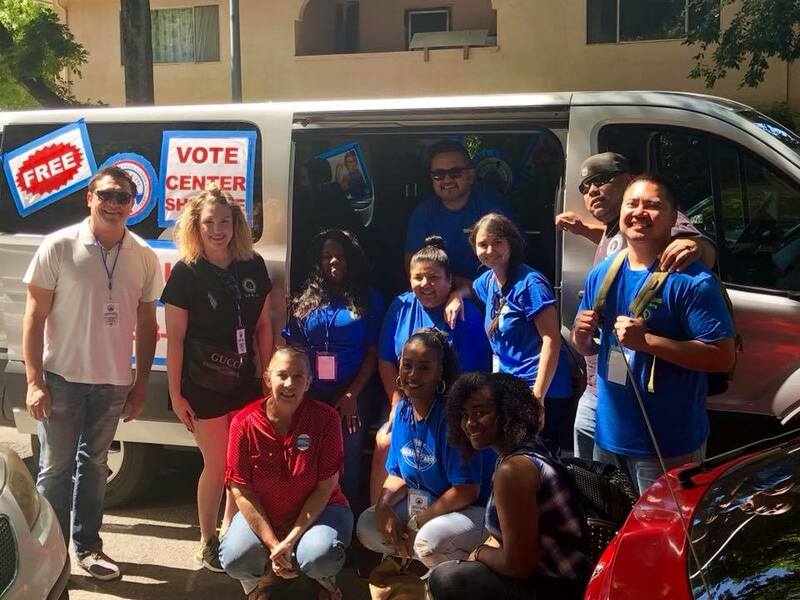 In addition to the extensive phone-banking and door-knocking that they did themselves, the organizing stewards were also tasked with recruiting their fellow 1245 members to volunteer to get out the vote over the weekends. Each team of organizing stewards hosted a volunteer kick-off on the Saturday before their assignments officially began, and upwards of 30 volunteers from Local 1245 gave up their weekend day to participate on their own time. A whopping 16 volunteers from 1245 attended the Sacramento kick-off, with some also bringing along their family members, and Sacramento Labor Council Executive Director Fabrizio Sasso recognized Local 1245 for turning out the largest number of volunteers at a labor canvass. 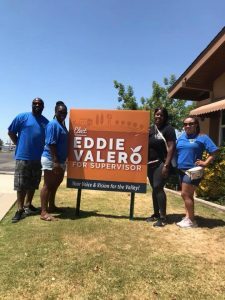 In Fresno, 11 members volunteered their time on the Saturday before Election Day, braving the scorching-hot weather as they canvassed Tulare county to get out the vote for Eddie Valero. Rene Cruz Martinez contributed to this report.